Polyester, or polyethylene terephthalate, is a fully synthetic material made from petroleum-based plastic that is essentially heated until it’s a big gooey glob and then pushed through a disk with holes drilled in it, much like a garlic press or your old playdough toys. This creates long, fishing-line-esque strings that are then stretched, thinned, and cut to mimic cotton fibers, at which point they go through a much similar weaving process to form yarn that feels much like its naturally occurring counterpart. Polyester came about after WWII as the result of the global supply of natural fiber based cloth being depleted during the war. Polyester was (and still is) seen as a cheap alternative to cotton and wool that is fairly easy to mass produce. Today, many polyester manufacturers use recycled plastic bottles as a source of their plastic, which makes it cheaper and more eco-friendly to manufacture. 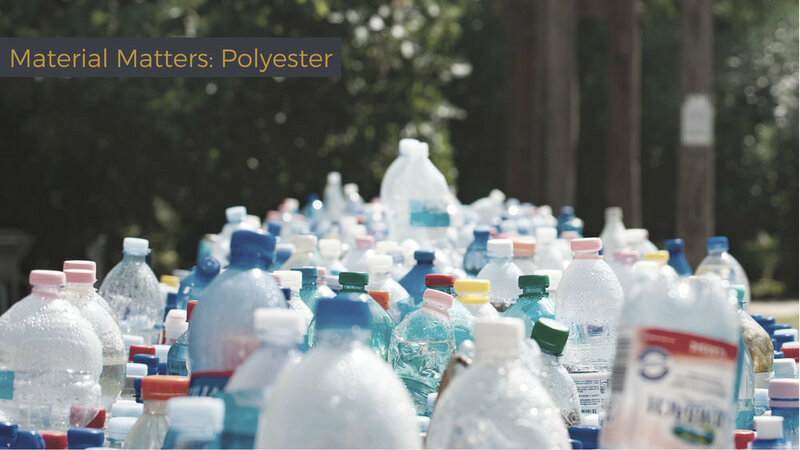 Because polyester is made from the same plastic we use to make bottles, polyester is a non-water-permeable fabric. This means there are little moisture wicking properties in polyester, aka it doesn't breathe. Compared to cotton, which can soak up 27x its weight in water, polyester only can hold 0.4% of its weight. This is why some of those lightweight shirts you bought from a tourist stand in New York City a few years ago feel soft and light but make you sweat like crazy. This is also a big concern for suits and blazers. Polyester blends in these garments make them very hot and give them a bit of a cheap look. The fact that it’s hydrophobic also poses a challenge in the dying process. Due to polyester being water resistant, it must be dyed with special chemical-based dyes which are not environmentally- or human- friendly. The use of these dyes has led to many harmful effects for garment dyers working with polyester, causing many humanitarian groups to advocate against its use in the clothing industry. So the next time you are looking to buy a shirt, pants, or suit, check the tag for polyester, anything over 15% should probably be avoided. Polyester versatile so can be machine washed and dried. However, if you do end up needing to iron, set the iron to a lower/medium heat, as the higher heat and distort the plastic fibers. Stay tuned for more articles on the materials we interact with every day because when it comes to what you wear, material matters.